The Domaine Puech Malou is situated in the department Tarn which is part of the southern French Occitanie region, previously known as Languedoc-Roussillon and Midi-Pyrénées. In these beautiful surroundings there are two magnificent holiday homes: The Farmhouse and The Cottage. Both houses are situated on a historic and picturesque property and can be rented for a well-deserved holiday. The Domaine Puech Malou sits on a sunny hilltop, 525 meters high in the middle of the French countryside. In the Occitan language ‘puech’ means hilltop and ‘Malou’ is the name of an old variety of apple. The Domaine is part of the idyllic small community Puech Malou which is part of the nearby municipality of Teillet. Centuries-old Albi is only 30 minutes away by car and within the hour you reach Toulouse. On a clear day, you can see the mountaintops of the Pyrenees in the distance. The surroundings offer unspoiled scenery, beautiful views and characteristic French villages. The beautifully restored and picturesque holiday homes The Farmhouse and The Cottage have kept their charm and atmosphere and are well decorated with an eye for the smaller details. Both houses (with all facilities) are centrally located within the 8.000 m2 property, each with its own garden and sitting area. The former fields around the houses have now been landscaped into beautiful park-like gardens with various terraces. You can enjoy the beautiful views, breath-taking sunsets, balmy summer evenings and a spectacular starry-spangled sky. We feel very strongly about peace and quiet, space and privacy. We would like you to feel at home so you will enjoy this very special place and will regard your stay as something valuable. You can be assured of a wonderful holiday whether you come in a group of up to ten people (if more, please contact us), or two of you come for a well-deserved break or you come on your own to get away from it all. Holiday home The Cottage faces south-east onto a private garden (around 1,000 m2) with colourful hydrangeas, cedar trees which supply shade and where you will hear frogs, crickets and birds. On the private terrace with teak table and chairs you can enjoy your meals in comfort. The kitchen is well equipped with all modern appliances. There is a very comfortable sitting area and a dining table with chairs and a woodfire to keep you warm in early spring or late summer. In the bedroom, there are beds with box spring matrasses and an en-suite shower with toilet and washbasin. The peace and quiet, along with beautiful views over the hilly countryside, spectacular sunsets and star-filled night skies provide the ingredients for a wonderful holiday. 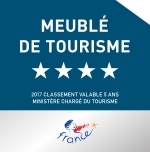 This very romantic Cottage has just been rated 3-stars Meublés du Tourisme by the Comité Departemental du Tourisme du Tarn Midi-Pyrénées and offers the perfect hideaway “just for two’. Centrally located in the southern French Occitanie region, previously known as Languedoc-Roussillon and Midi-Pyrénées, is the department of Tarn which is named after the river. The Tarn department has a gentle climate which is influenced by the Atlantic Ocean as well as the Mediterranean Sea. The region is rich in nature, culture and history. The landscapes vary from valleys surrounded by hills to mountainous areas. This rich variety in landscapes combined with the architectonic and cultural heritage, the traditional resources and age-old history result in in a varied couleur locale and an amazing holiday destination. 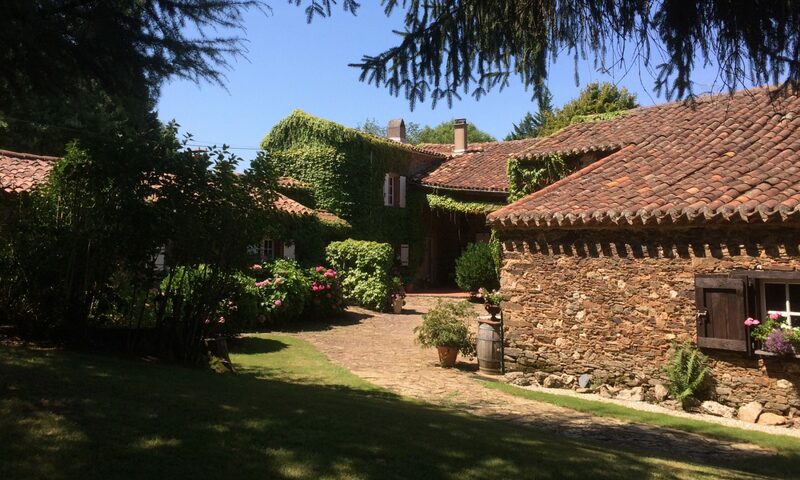 In the Tarn you will find spectacular scenery, the mountains Monts de Lacaune and the Montagne Noire, the Sidobre granite rocks, the Gaillac vineyards, the charming Pays de Cocagne and last but not least, les Bastides des Albigeoises. There are medieval villages such as Bruniquel, Puycelsi, Penne, Castelnau de Montmiral and Cordes sur Ciel. History lovers and lovers of beaux villages de France can indulge themselves visiting Lautrec, Ambialet, Lincou, Brousse le Chateau, St. Izaire, Coupiac and Plaisance. But if this is not enough for you, there are more castles, ruins and Cathar caves within reach. And go and see the fortified medieval city of Carcasonne, Rodez and its Gothic cathedral, Milau and its impressive viaduct and last but not least, Toulouse with the Renaissance palaces. What was once a settlement in the Bronze Age, is now one of the most picturesque districts of the town. Albi is situated on the river Tarn and has the typical history of a south-west French city, with an imposing cathedral, lively districts and quiet enclosed gardens. But it is mainly the contagious Mediterranean flair which shows itself in the place of birth of Toulouse-Lautrec. Albi is a Unesco World Heritage Site. The old centre of this episcopal town is situated around the imposing Cathédrale Ste-Cécile d’Albi and there are winding old streets, lanes, shops and restaurants. Characteristic houses made of red bricks with terracotta rooftiles together with the Mediterranean atmosphere gave the town its nickname ‘Albi the Red’. The Palais de la Berbie, next to the cathedral, was once the residence of the powerful bishops of Albi. The completely renovated Museum Toulouse-Lautrec can be regarded as one of the best contemporary French museums. The terrace-shaped gardens of the Palais offer a beautiful view of the town and the river Tarn. You will enjoy the typical art de vivre of Albi. If you would like to thoroughly explore the surroundings, you will find a centuries-old network of paths with a total length of 3,500 kilometres. There are walks for the recreational walker and, for the more experienced walker, walks taking several days to complete. There are numerous well-marked paths for walkers and cyclists with a great variety for all levels of experience. And of course, you must take a trip by canoe along the Tarn. While for golf lovers, there are beautifully laid out golf courses. To make things easy for you we have seven Circuits du Tarn available for you at the Domaine. These well written, marked out day trips vary from 70 to 175 kilometres. You can drive through the Tarn countryside by car or motorbike following these Circuits. 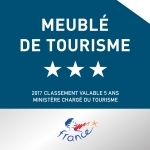 And each of these trips have their own theme so you can get to know all aspects of this beautiful part of France. Traditional festivities, colourful markets and gastronomic specialities will make your stay in this area complete and they will give you the feeling of joie de vivre in the broadest sense. We hope to be able to introduce you to this beautiful part of La Douce France. These weekly rates are based on self-catering. A single supply of bedlinen, bath towels and kitchen towels is included. Your beds will be made when you arrive. You will receive further information, conditions and booking instructions along with a personalised quote. * Mid season : April, May, first half of June, second half of September, October. * High season: second half of June, July, August, first half of September, May and Autumn school holidays. From May until the middle of June and in September and October we can offer you some special arrangements: Culinary, Walking and Golf arrangements. Combinations of these are also possible. Would you like to book a private arrangement for your group, a minimum of six persons is required. Please let us know if you are interested. We will take account of your specific requirements, where possible and would like to discuss the possibilities with you. If you would like to spend a week for gourmets, a cooking holiday for up and coming chefs or simply for someone who would just like to be cooked for, please let us know and we can discuss the various possibilities. Walkers, whether experienced or beginners, can have beautiful hill walks daily and enjoy the countryside. There is a wide choice of woods, open fields, valleys, lakes and rivers. Maps and routes are available. And you are of course very welcome to accompany us on our walks in the area. We can arrange a suitable offer for you. For the golf lovers we have a special arrangement with one of the excellent golf courses in this area. There are various possibilities, so we would like to hear from you what you are interested in. After sending you will receive a confirmation of your request as soon as possible.